Not many minutes drive from our home of five years in Austria lies a ruin, the remains of a fortress built some 860 years ago (1154-1161), and once the largest fortress in Oberösterreich. It's on a hill, the view is spectacular, and definitely a trip worth while for history buffs like me. The name is derived from the words "vom Berg schauen", which means view from the hill and was through the years--through the centuries, rather--owned by various counts, struggling to keep it, struggling for power and position. Why am I bringing this up? Many fortresses and castles are far more beautiful, even better kept. I love history. For some reason, I imagine that other must, too. But the truth is, not everybody has a passion for it like I do. A few years ago I presented a distant relative across the sea with an extensive genealogical paper on her ancestry, names and dates and stories I had collected and worked on over many, many years. She did not thank me. She was not impressed with all the hours of research. She was not the slightest interested in stories of people in whose footsteps she is now walking. She simply said, "I am not interested in dead people." Well, I am interested in those who walked before me and in the lives they led, places they lived, things they did. I love art history with boundless enthusiasm, studied that and the history of clothing at the university. I loved history in school growing up, started family history research as a fifteen year old, and when I enter a bookstore I automatically steer towards the historical fiction section. When I visit an old fortress, church, or castle I imagine being there among the people who lived there centuries ago. It's fun to employ the imagination and hear the sounds, sense the smells, and capture the daily life of young and old. How can anyone not enjoy that? 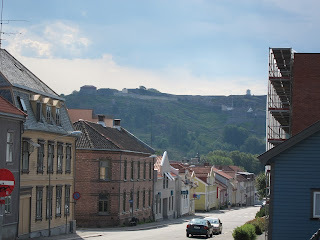 The photo of Arnfinn after the bicycle race in the blog entry "Clean" from last week was taken at the fortress of Fredriksten in Halden, Norway, the finish line of the 80 km race. The fortress was designed in 1661 by my 9th great-grandfather, Wyllem Coucheron. How cool isn't that? I have learned a lot about him, but wish I knew more. Photos from Internet of Schaumburg Ruin and also Fredriksten Festning (Fortress), below, taken last Saturday.